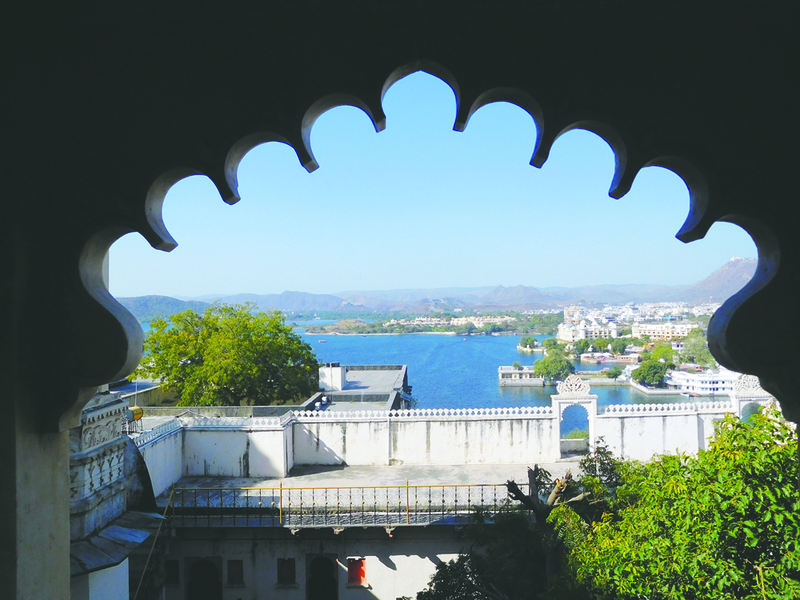 We can finally say it: Udaipur is the city to die for. 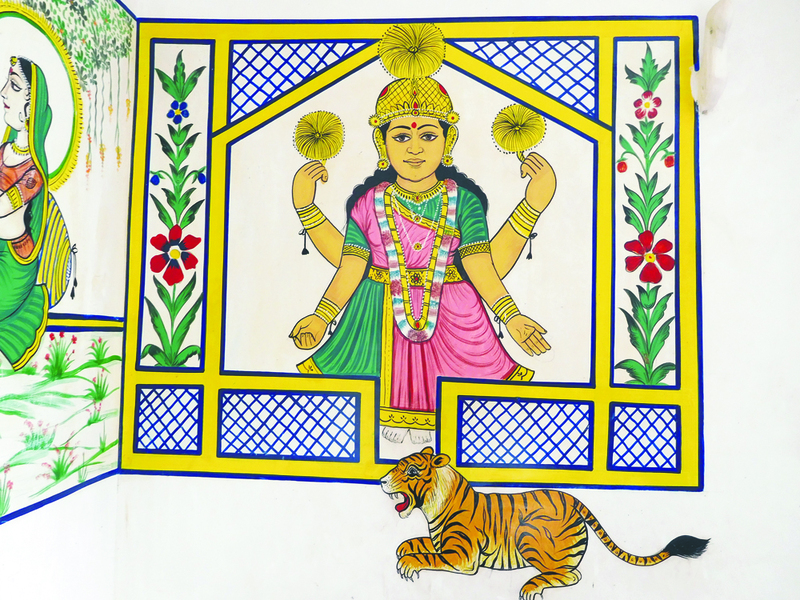 It was the climax of our trip to India. We took the superhighway from Jaipur with its numerous toll booths to Udaipur but had trouble locating our booked hotel. Finally with a call to the hotel, we were told we’d be picked up in a minute, which we were and we followed the large black mini-van (to add to the drama) to a location with no sign. We were told to follow one man up a steep flight of stairs to a lone room that seemed isolated. There was no reception and we were told that the name of the hotel had been changed from the one on booking.com, all rather strange. We took a leap and told the man this was not what we had expected and left with our bags and our driver, only to end up a block away at the fabulous Landmark Hotel, modern with elevator and all amenities for $80cdn including breakfast. This place was lavish compared to our other bookings so we gladly booked for six nights. The rooftop restaurant at Landmark is romantic with heaters and lights that flash on when you pull out your chair. It was nippy but we thoroughly enjoyed our salt and pepper vegetables and lamb and chicken kebabs, a cut above for slightly above what we usually pay. 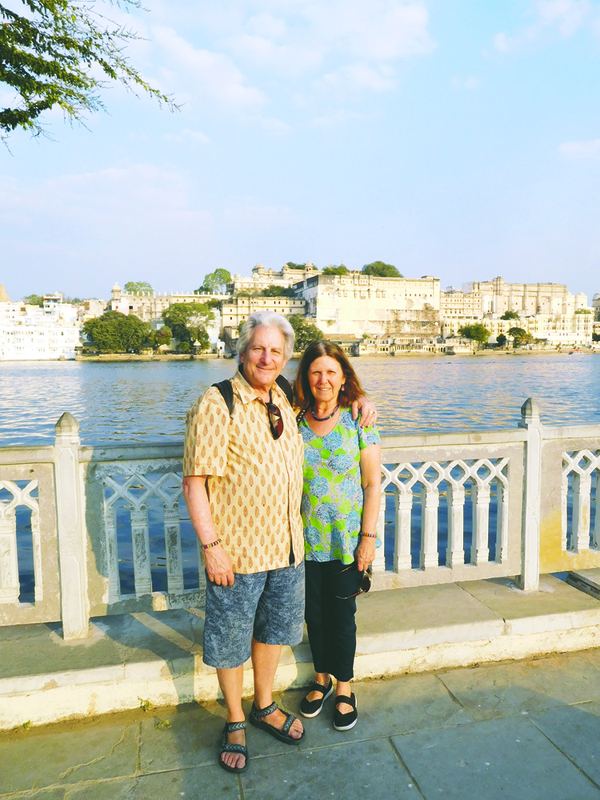 We were happy to be in these pristine surrounding in a lovely and walkable neighbourhood and were ready to hit the Udaipur streets. It’s more airy, more beautiful, easier to navigate, more walkable, less polluted, more scenic that the other places we visiting in January, 2018 and the shopping… wow! The first morning we headed out of our classy hotel and caught a tuk tuk to the Old Clock Tower where we explored the market, a big improvement over other markets we’ve seen in India for its accessibility and safer narrow streets with shops lining both sides. We could actually cross from one side to another and shopkeepers were friendly without harassing us. We took another tuk tuk to the Foot Bridge, walked over it to the other side where we ate at a recommended restaurant called Little Prince. It was suggested in Lonely Planet as having Israeli fare but it was a disappointment due to the surly waiter, dirty tables, flies and mediocre portions. Israeli food has been better. Next we walked through the wide pristine market with jewellery shops and textile/clothing/pashmina/handbag shops, wonderful in their multifarious colourful offerings. We had coffee at a lovely café and finally dinner at a scenic, atmospheric resto facing the lake. 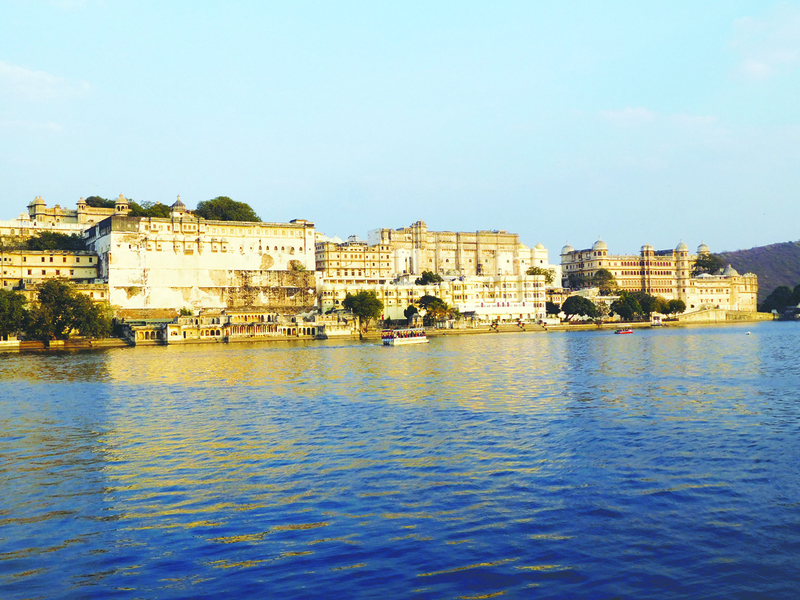 This whole area, which is across the bridge, is the best place to hang out in Udaipur. An unassuming designer of costume jewellery turned out to be my friend and let me know the difference between real gem stones and fakes. I bought almost all my gifts from him and returned twice. It was fun to watch the people go by, sit in our favourite café where we cheated on chocolate cake and while away the glorious days — such a difference from the crowds and harassing shopkeepers in other towns and cities. And I could actually walk without fear of being trampled. Perhaps there is in part due to the animal rescue that we visited a few kilometers from the city. But this rescue and sanctuary for abused and neglected animals of every shape deserves its own article: I’ll write about that in the next issue. 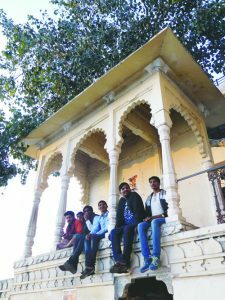 One morning we did a lot of touring including the palace and a boat ride to an island called Jagmandir a wedding venue and not that interesting a place, but the boat ride was fun. What a gorgeous city! Even the dogs look healthier here. There are so many pictures of the City Palace which we visited on our third day. On the last evening we attended a performance of Indian dance in the museum in a part of the Old City. The photo on the opposite page is testimony to the acrobatics of the dancers. Yes, this photo is real and the dancer actually balanced that many pots on her head! After our six days in Udaipur, we flew to Amritsar, home of the famous Sikh Golden Temple, where we spent the last three days of our trip. 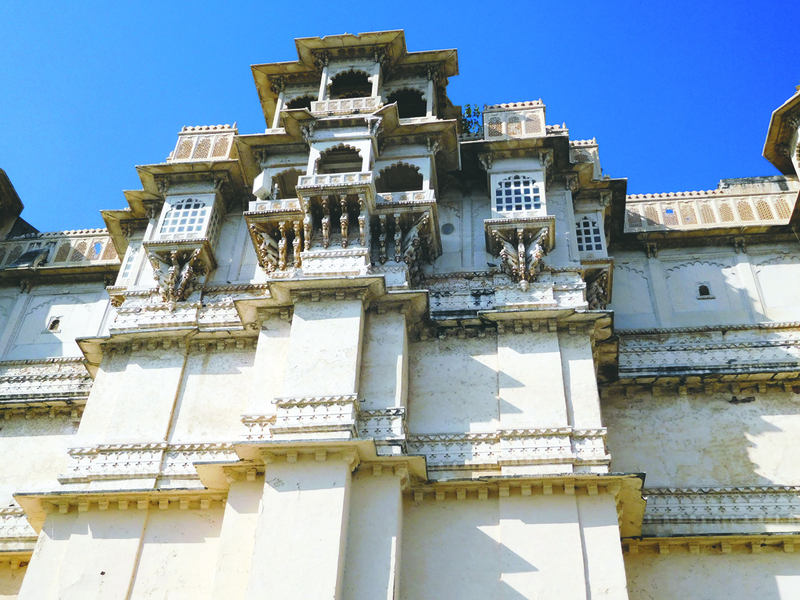 Be the first to comment on "Times and Places: Udaipur: our favourite spot on our Indian tour"